KUALA LUMPUR -- Malaysia's ruling coalition is expected to win when the country goes to the polls on Wednesday, despite uncertainty over the outcome of nearly one-fifth of seats, according to the latest survey by the Merdeka Center for Opinion Research. 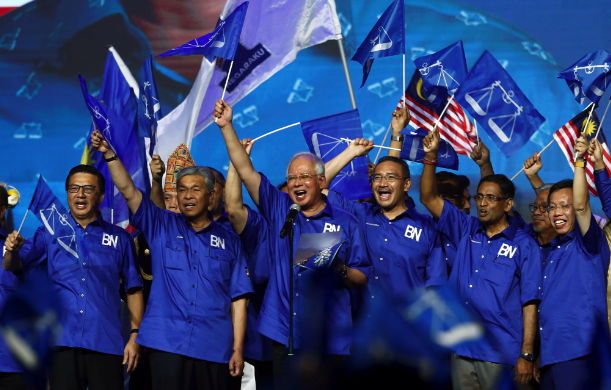 In a poll carried out between Saturday and midday on Tuesday, Prime Minister Najib Razak's Barisan Nasional coalition, or National Front, is predicted to secure 100 of the 222 parliamentary seats up for grabs. Pakatan Harapan, or the Alliance of Hope, coalition of opposition parties headed by former Prime Minister Mahathir Mohamad, is likely to win 83 seats, while the alliance's breakaway member, the conservative Parti Islam Se Malaysia, will take two seats. The remaining 37 seats are considered marginal and may swing in any direction. "The high number of margin seats implies that voter turnout will be a critical factor in determining the outcome of many seats on election day," said the independent pollster. The opposition is hoping for a turnout rate of 85% -- the same figure achieved at the previous election in 2013 -- as it believes that will work in its favor. Even so, with the strong support of the country's majority ethnic Malays, who are mainly concentrated in rural districts, the National Front is still poised to win. Economic issues and good governance were at the top of voters' concerns, the survey found.